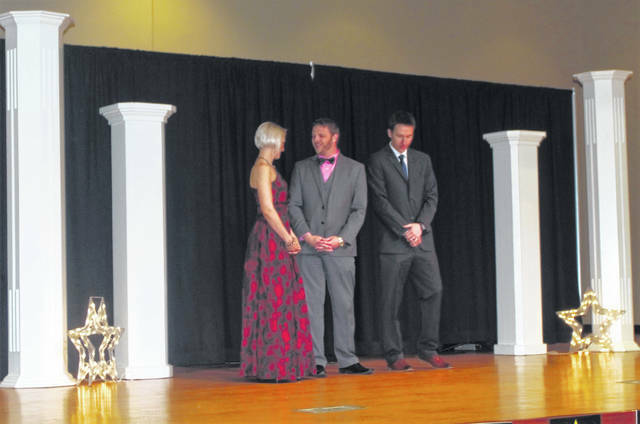 LIMA — Various organizations and business professionals in the Lima community were honored during the 16th Annual Lima/Allen County Chamber of Commerce Award Gala Wednesday. Jason May won the Young Leader of the Year Award because of his professional experience, devotion to improving quality of life through civic and community service, active development of leadership skills and continued growth towards future goals. Visual Eyes was nominated for the Emerging Business of the Year Award because of its uniqueness, independent ownership, successful transition from a start-up to an emerging business and community involvement. NOW Marketing Group won the Woman of the Year Award because of its demonstrated of excellence, creativity, initiative in their business, investment in the community and its empowerment of women to be successful leaders. Our Daily Bread won the Nonprofit of the Year Award because the organization has promoted a safe and accessible workplace, is financially sound, has mentored employees and others in the community, has participated and supported other non-profit organizations and has improved the Allen County economy. Annette Swisher of the Wingate by Wyndham won the Athena Award because she has demonstrated excellence, creativity, initiative in her business, has invested time into the community and has empowered women to be successful leaders. Swartz Contracting and Emergency Services won the Small Business of the Year Award because the company has been financially stable and profitable, is involved in the community, has 150 or fewer employees and has been in business for five years or less.